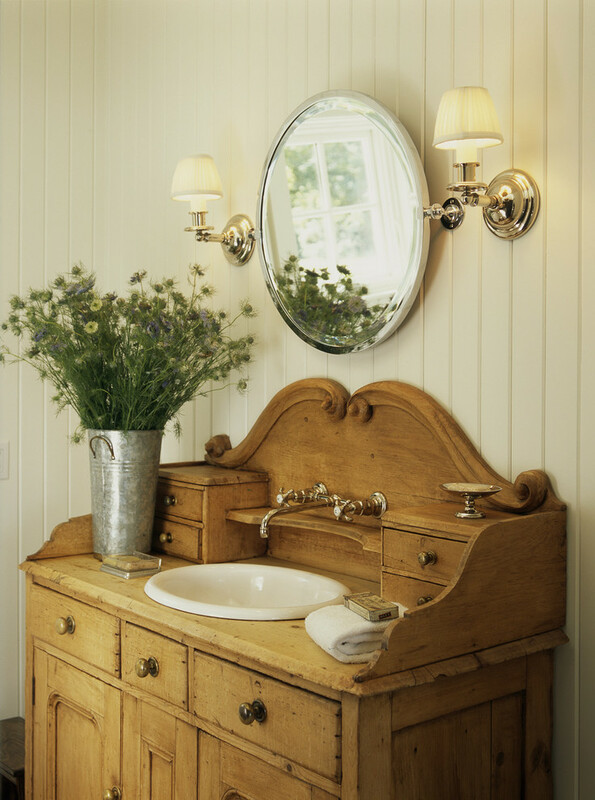 Over years, bathroom vanities with cabinetry have been popular in all around the world. They offer practical and best solution of storage in stylish look. They also look so stunning after other additional but crucial elements (such as vanity mirror, vanity lighting, and even just some decorative items) just have been added. 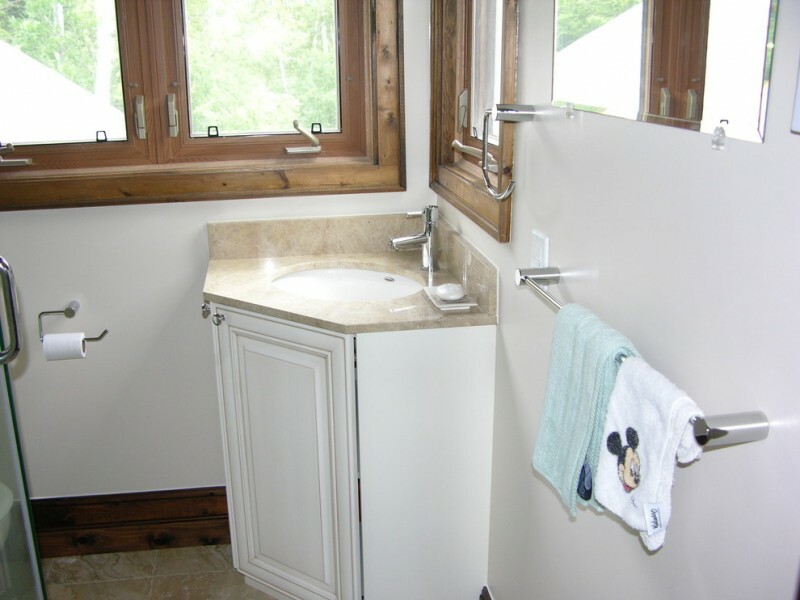 As one of bathroom vanity’s basic elements, cabinetry itself is used to accommodate bathing stuffs and supplies. With such storage, we have easy access to take them when we’re enjoying fun bathing. Just take a few steps to grab the things we need. There are so many choices of bathroom vanity cabinet ideas designed in different style with specific details. To know them in more details, please check them out here. Dual-cabinetry system with double basins keeps so stunning. 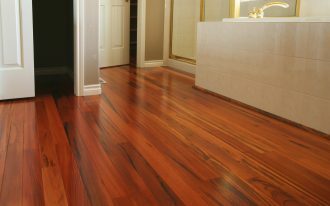 Traditional style is clearly seen from its physical look especially from its curly design inserted on wooden-made cabinetry system. 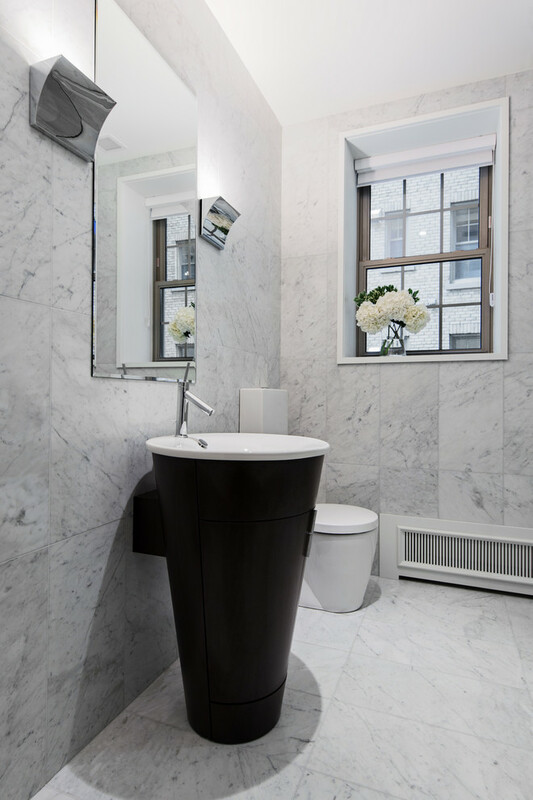 White marble top here also supports classic/ traditional look on vanity. 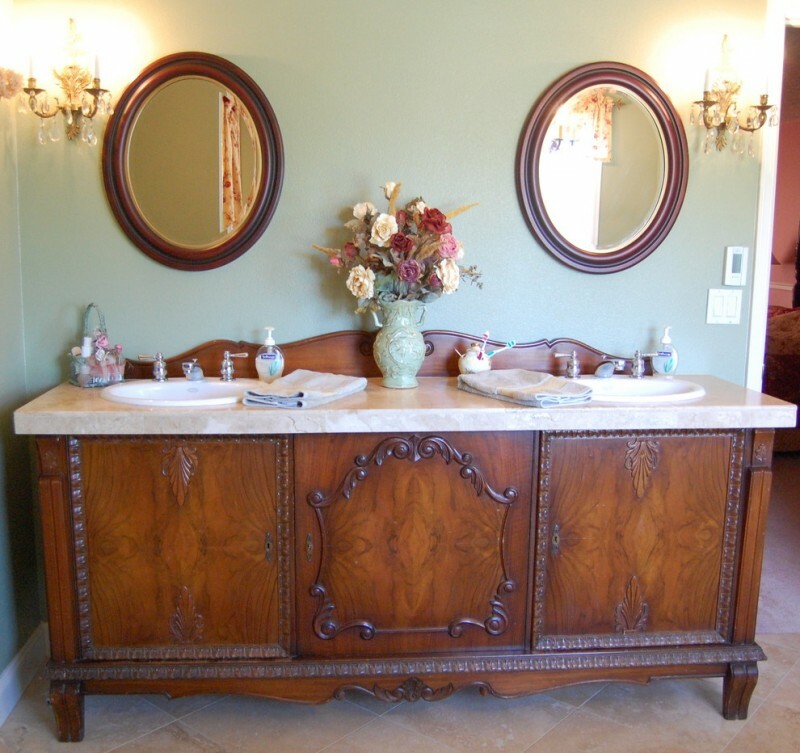 Put such traditional bathroom vanity for any style of bathroom. 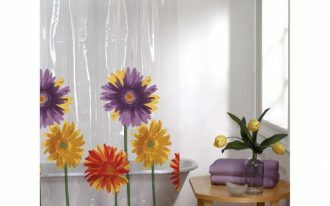 Keep it as a stunning focal point to your bathroom. Just like the sample above, a traditional bathroom vanity looks so eye-catching after being added double frame-less vanity mirrors and double huge pendant lamps in which those both elements are designed in modern style. This package of bathroom vanity is designed in classic style. Cabinetry system, for instance, emphasizes high class handmade-craft works that create elegance and luxury. The traditional craft works, as we know, are identical with antique furniture and home appliances. Moreover, classic, traditional, and antique appearance is obviously existed after a couple of classic-style vanity lamps and round-framed mirrors are added. That’s so perfect. Isn’t it? In short, a traditional-look bathroom vanity is nice and available to install in a narrow space. To make it ideal, just replace the cabinetry into drawer system. Why? Drawer system is much more effective and efficient for limited space. 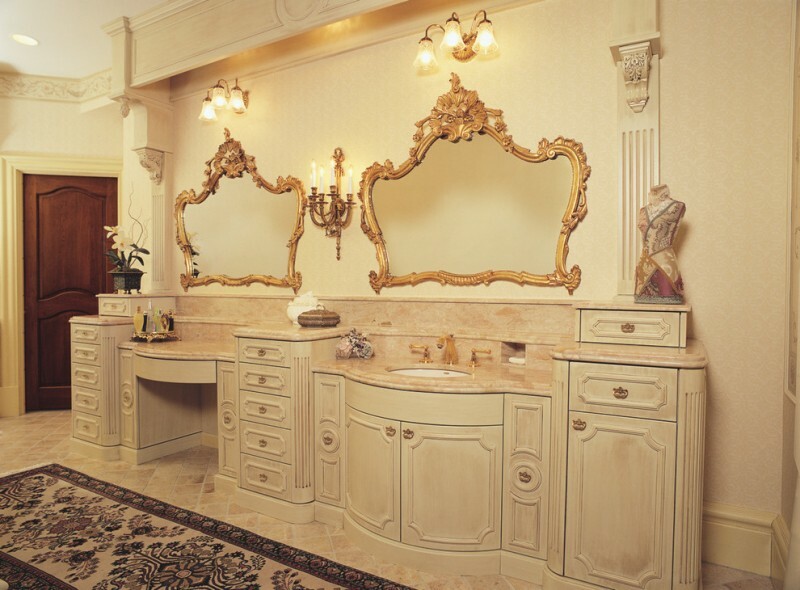 Right size of vanity also needs to be main consideration, especially for creating a best proportion. Small-sized vanity with drawer series, for instance, is so well-recommended. It’s smart idea of combining a classic and rustic as one style. This idea focuses on classic for design and raw rustic for material. Unfinished-hardwood vanity base needs to be a highlight since it has been produced without finishing. The goal is to make us focus on how natural and shabby it is. Sometimes, such furniture is very unique to apply in recent interior home design ideas. 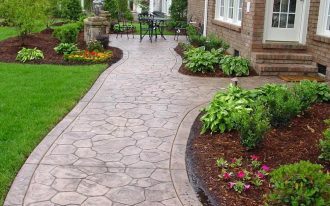 In addition, such idea also suits for any style of home interior styles. A Victorian-style bathroom style is luxurious, indeed. It’s more luxurious if all bathroom appliances are designed in similar style. Victorian bathroom vanity, for instance, will be a perfect choice as it presents a highly luxury and elegance for each detail. 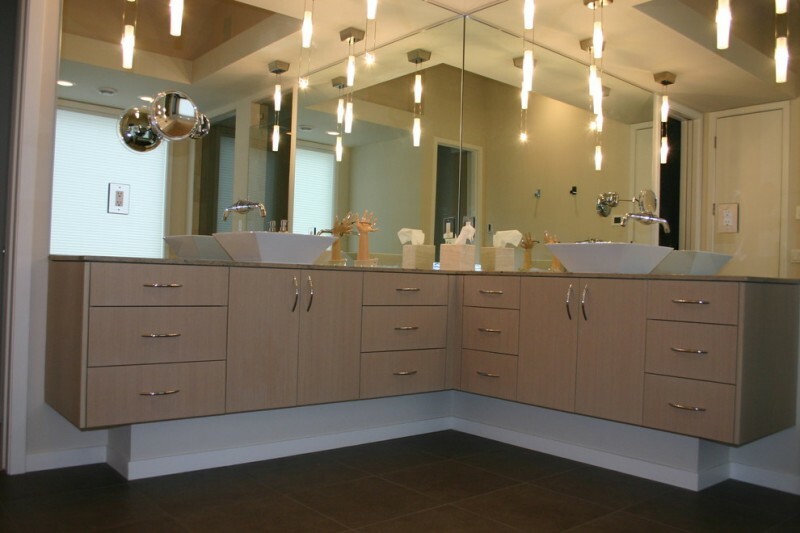 The color tones of vanity also affect the whole appearance of room. 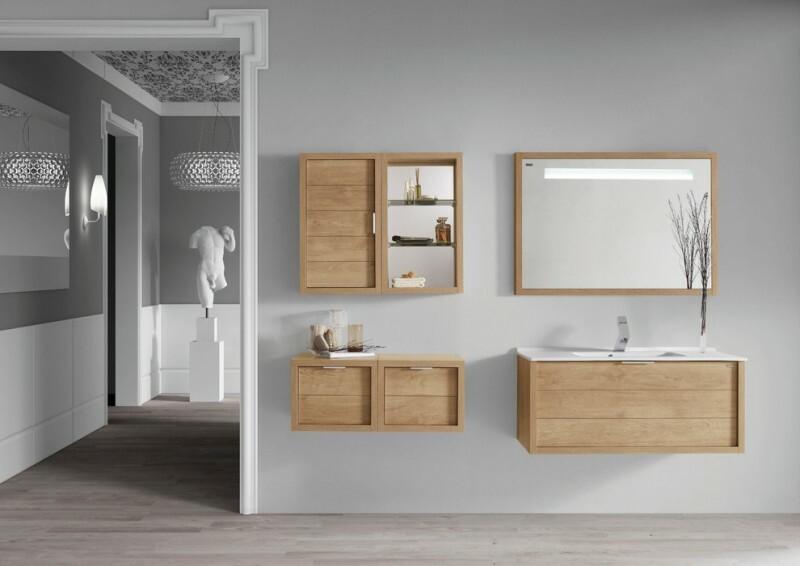 An idea of minimalist bathroom vanity with cabinet, of course, suits only for minimalist bathroom theme. 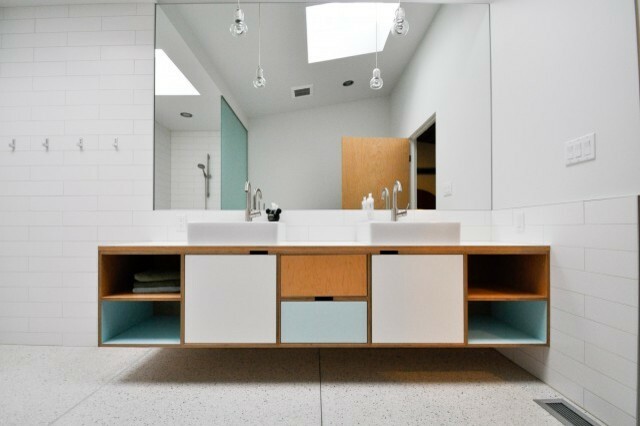 This kind of vanity focuses on hugely simplicity and functionality. The design is so simple but much more effective in function. Details of design are less important, but vanity’s function is much more emphasized. A small floating vanity with minimalist concept is always stunning to apply in a modern/ contemporary/ minimalist interior home design. It looks so simple but so classy. 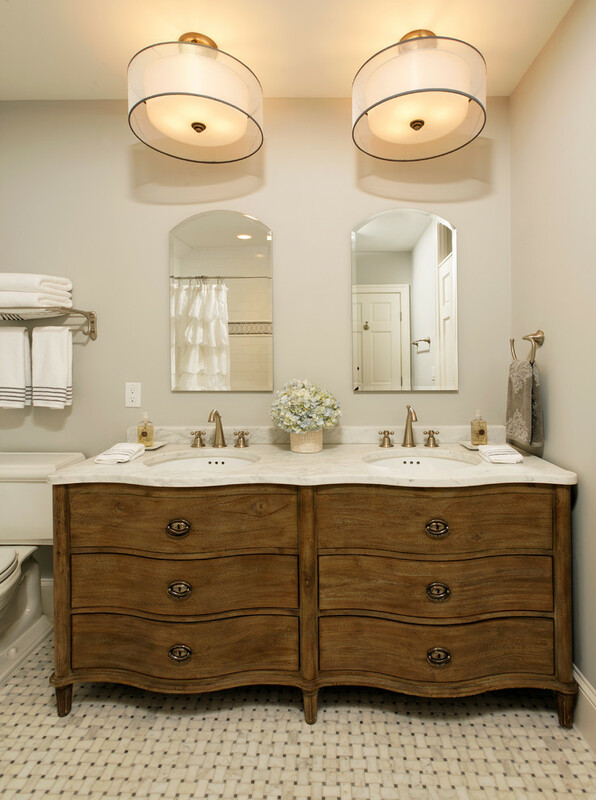 Wood color here adds the vanity’s value, so it looks adorable to stare at. Similar tone is also applied on tiny vertical shelves and mirror’s frame, so all these items blend together in one concept, minimalist! 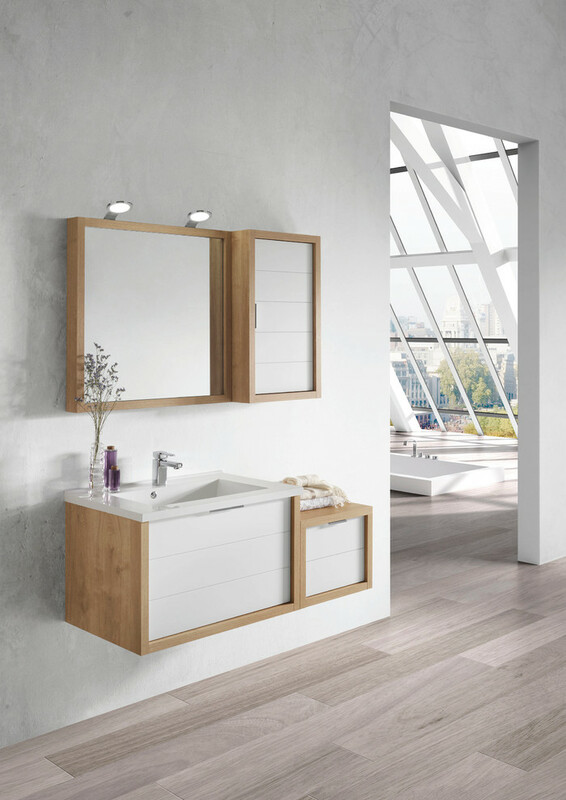 Again, floating vanity idea with wood color and minimalist look. Different to previous pic, this idea is huger in size, but similar in design. 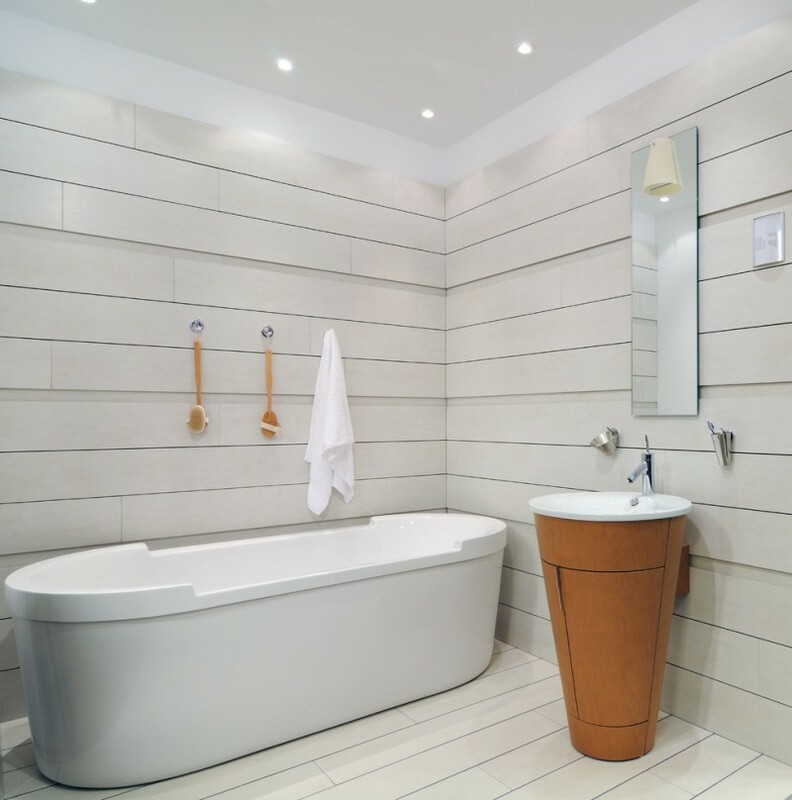 A minimalist touch is given to a modern minimalist bathroom idea. 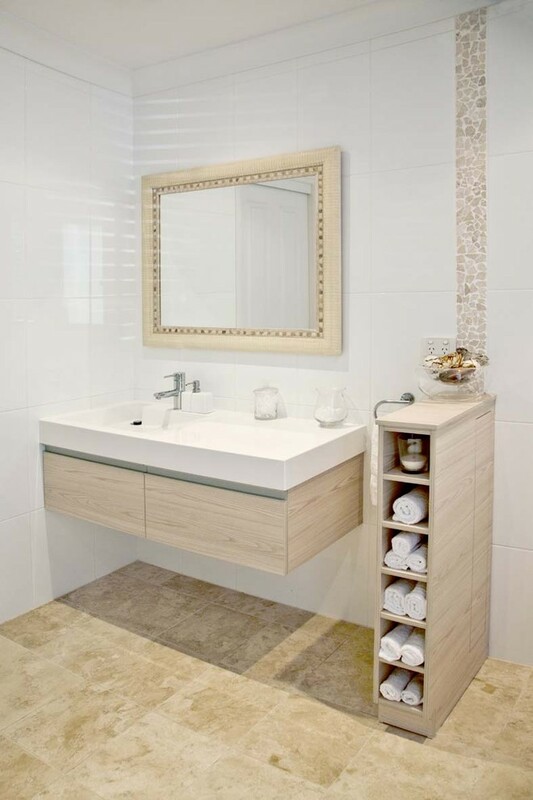 The vanity is simply design with attractive white frame. 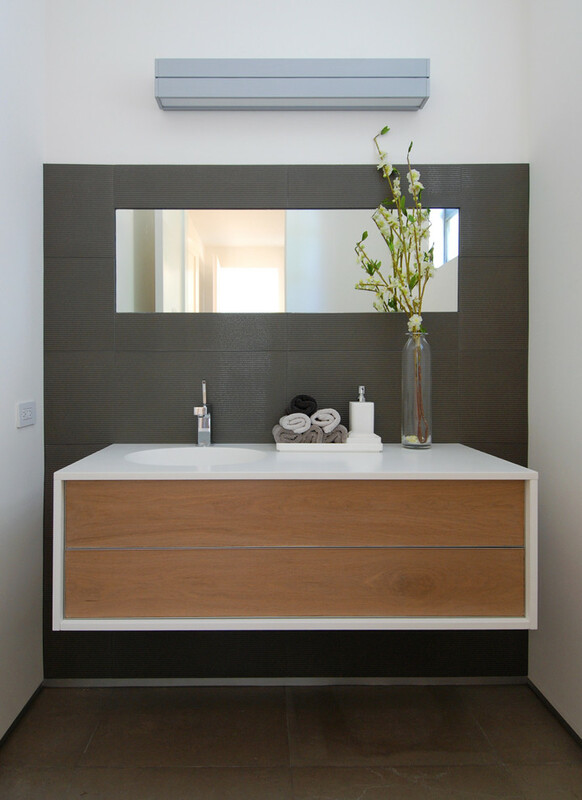 A rectangular mirror without frame adds significant value for textured and lined wall system. The combination is so stunning, right? This idea suits for you who are so adore a simple and tiny floating vanity. It’s really effective-space so it’s recommended for a small bathroom. Is it matched for a large bathroom, too? Absolutely yes. It’s optional to be applied for large or small space of bathroom. Still about modern-minimalist floating vanity idea; this one has little different look. The vanity is designed with additional part called extra vanity in mini version. This additional part is used as extra storage, so we can store any supplies or stuffs of bathing there. An oddly shaped bathroom vanity is a best alternative for you who want to possess a unique bathroom concept. 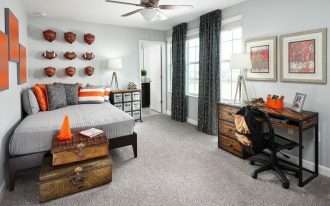 The pic shows orange with neutral-tone, so it’s available for being combined with any color tones. A huge and frameless mirror helps creating the room wider, simpler, and more minimalist. Another oddly-shaped vanity idea is when a simple vanity base is formed by multi eclectic walnut-veneer cabinets. 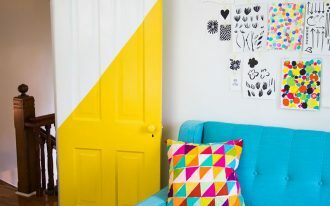 To make it more attractive, cover each cabinet’s door with soft color tones such as blue, white, or other pastels. A giant and frameless mirror is best complimentary for such vanity design. This one isn’t unique on physic, but its color application. The cabinets use multi-color concept to attract anyone glancing at. 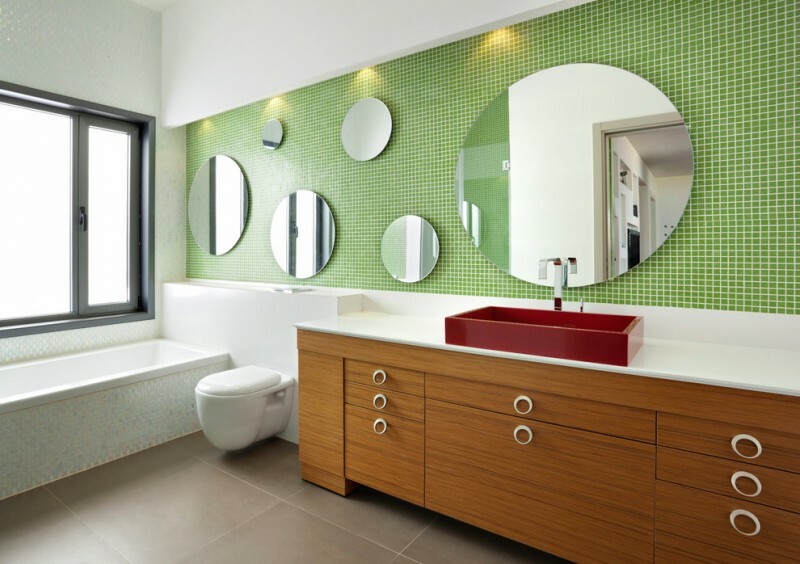 A full mirror attached on wall is also a great idea to let people to keep their eyes on stunning and striking colors of vanity. This is an idea how a huge mirror can move people’s interest in vanity only. Make tone and shape as the main focuses. The vanity is uniquely designed in cone shaped with white tone for the top and wood color for the base. The base is available for storing small-sized bathing supplies since it is inserted with open-able mini cabinet. And the following is a couple of other cone-shaped vanity ideas you may try for your lovely bathroom. 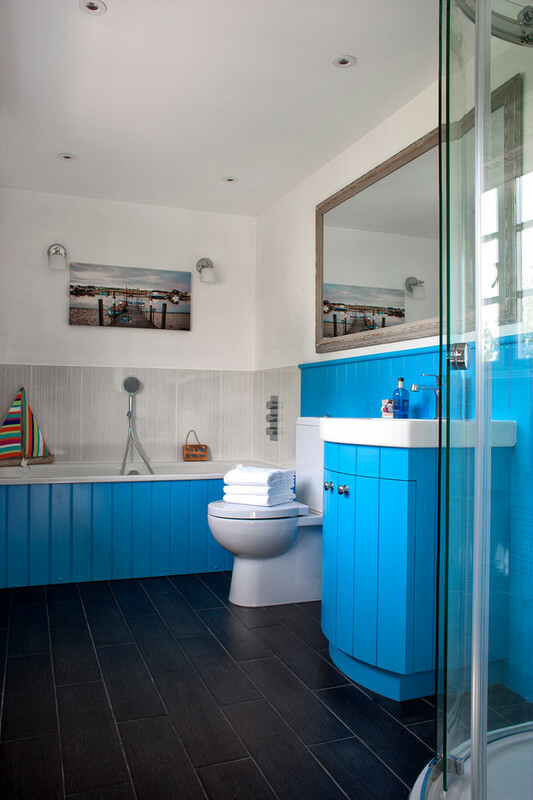 It’s smart solution to add much more attractiveness by using a striking color tone to a bathroom. 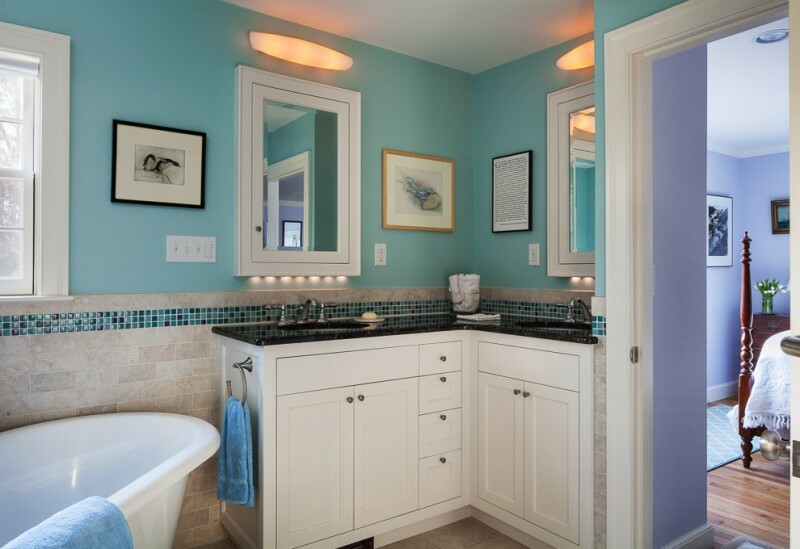 Use cool-blue color, for instance, for the base of our bathroom vanity and combine it with other contrast color tones such as black for bathroom floor, white for bathroom wall, and light grey for bathtub’s wall system. How elegant it is. This idea is inspired from a ranch with red as the main color theme. The vanity looks so luxurious with eclectic red tone on its storage’s face and elegant black covering the vanity’s base and surface. 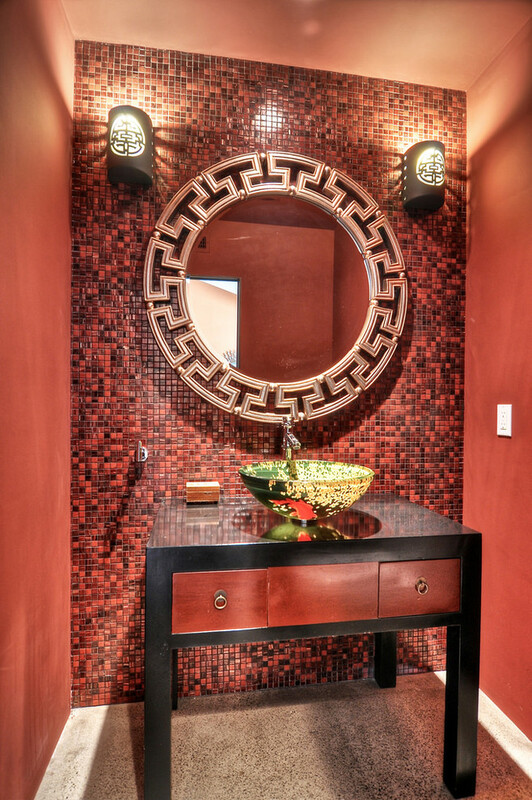 Not only that, take a look at the wall system behind the vanity; textured wall system which is garnished with randomly black-red adds aesthetic value on room. 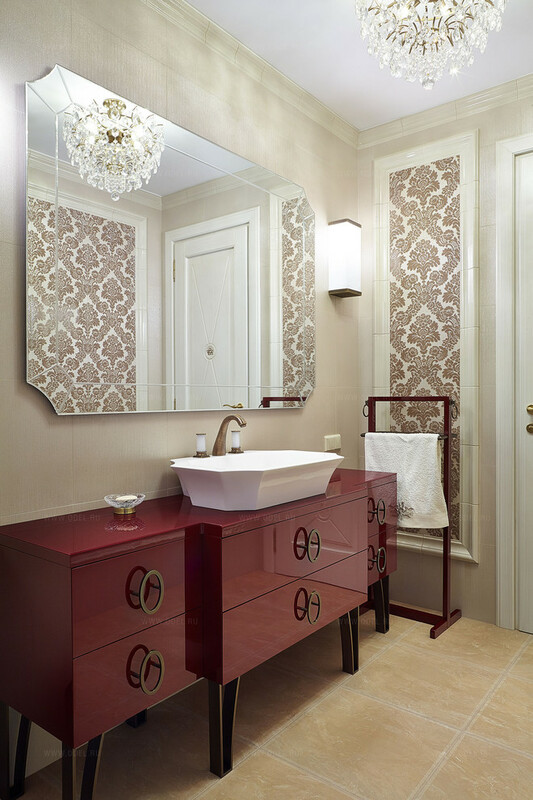 Dark red vanity is a nice choice for making an ordinary bathroom to be more interesting. Add striking door-handles to each cabinet as the focal point. Make sure to choose right color tone of handle by achieving best-matched proportion. Color emphasis isn’t merely focused on a vanity. 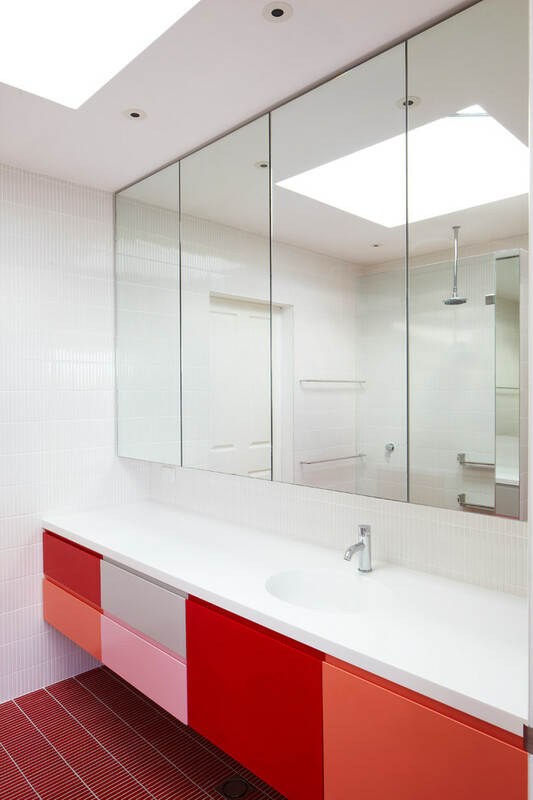 It can be used as the primary color of other bathroom’s elements like bathroom wall system. 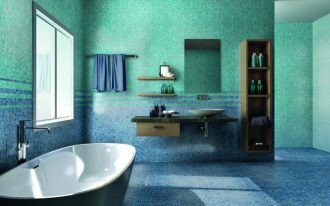 Textured green wall system, for instance, is a good idea to apply for an echo-themed bathroom. Decorative circular mirrors here are just the additional accessories. 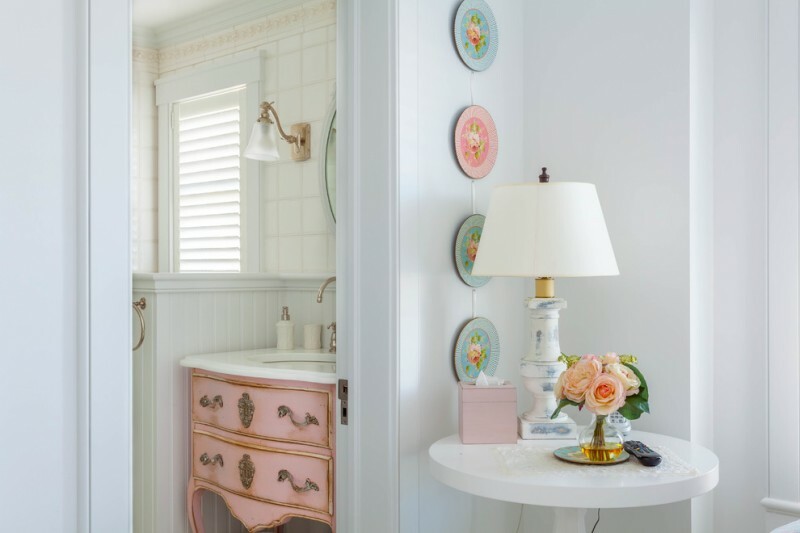 A shabby and chic pink bathroom vanity in Victorian style is also unique to apply in a French-home interior design. Isn’t it? Do you love something shabby but cool and stylish? 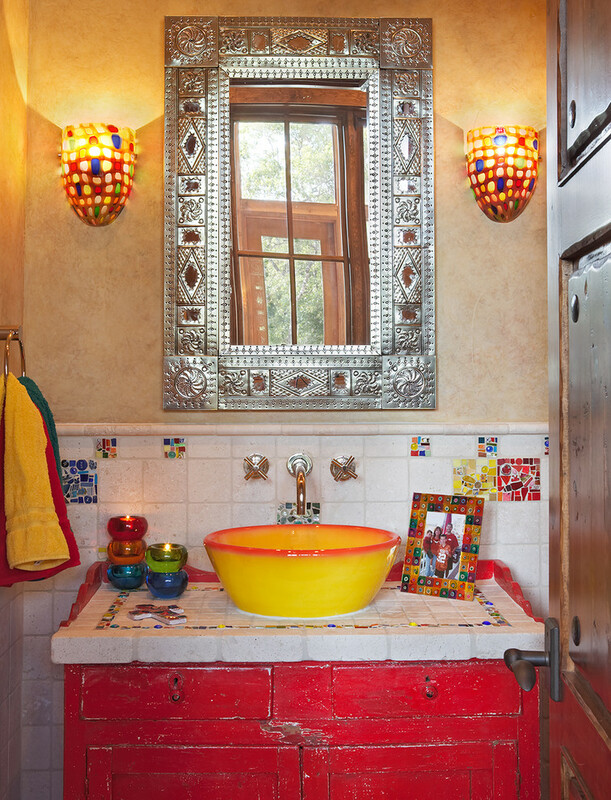 Just try to take this idea: shabby red vanity in vintage style plus hand-crafted tiles on top, and bright yellow basin & faucet. It’s more interesting by adding vanity mirror with texture metal frame. 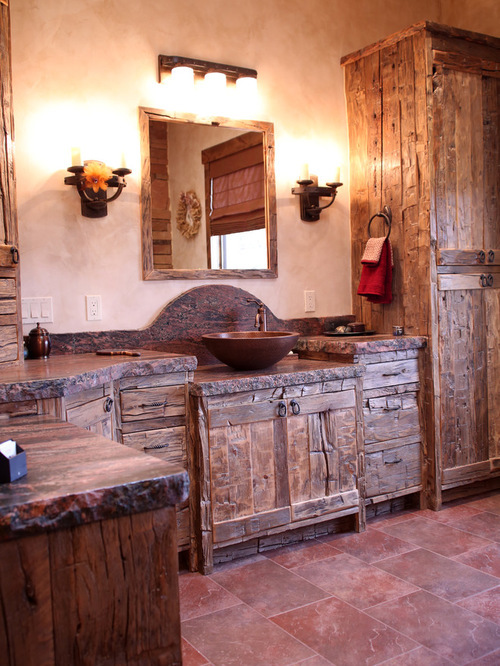 A raw rustic bathroom vanity idea suits for a ranch living space which is identical with dominant-hardwood use. 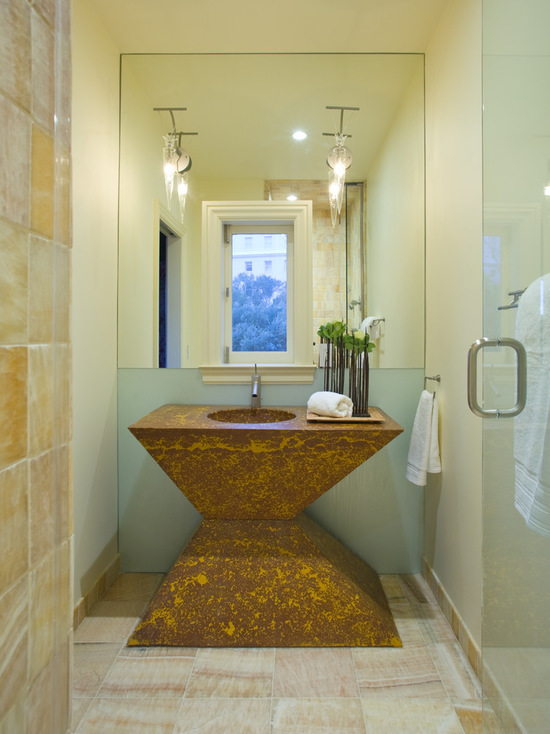 This idea uses a vessel sink, dark granite countertop, free standing tub, and dark wood-framed vanity mirror to complement. 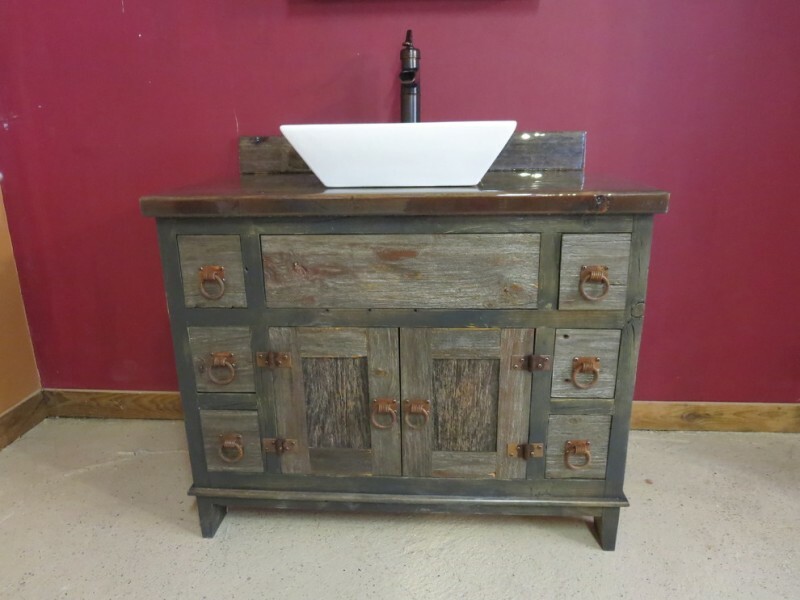 This is inspiration for a tiny rustic bathroom design. 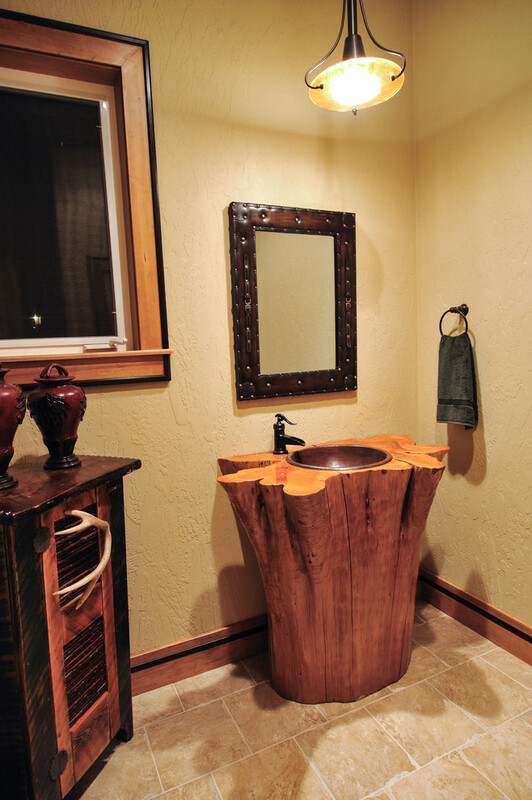 The owner uses a log as the vanity’s base with a hidden cabinet. The vanity is supported with wood countertop and pedestal sink. 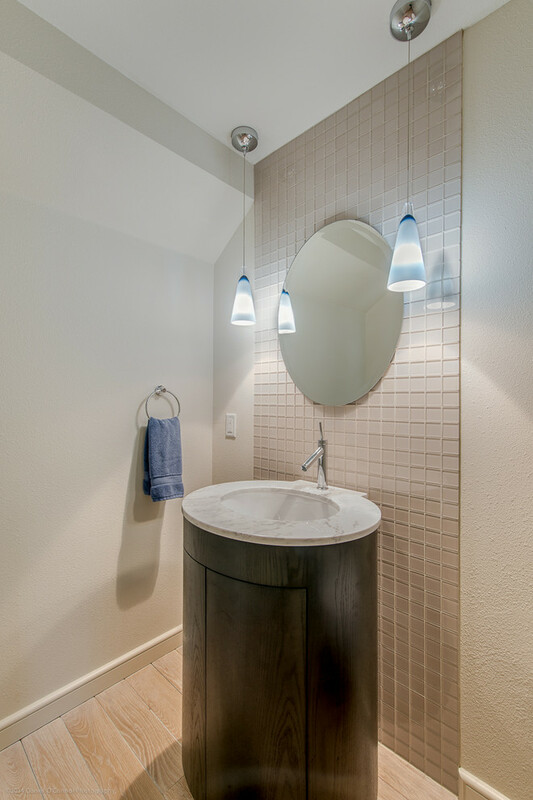 To optimize its function, the owner has installed black-finishing vanity mirror and a pendant lamp. 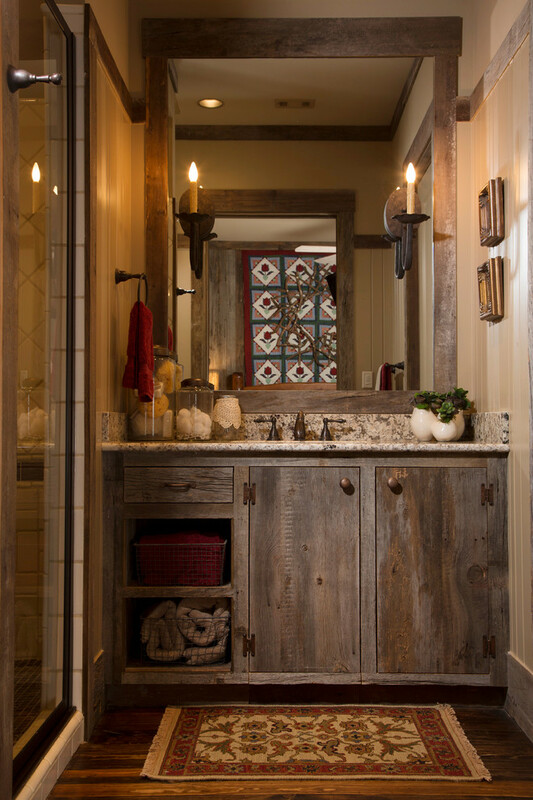 A lodge rustic bathroom vanity creates a nuance of warmth. This idea highlights some elements representing a ranch-model living space. Those elements are marble countertop, candle-like vanity lamps, and wood-framed mirror representing rustic look. 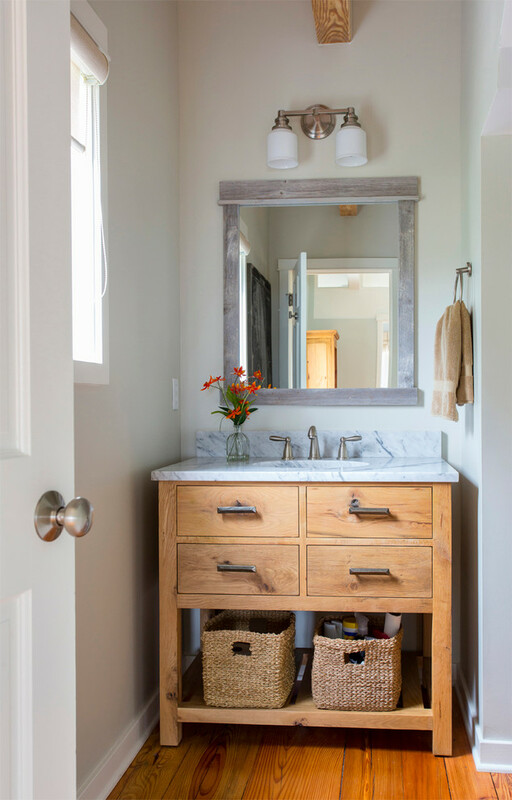 A reclaimed wood bathroom vanity in grey looks so striking by being added with a modern white free-standing tub. Two different styles in one frame: rustic and modern, is a recommended idea for you who want to mix both in one space. Mini L-shaped vanity or it’s commonly called an ordinary corner bathroom vanity is just one of corner vanity designs selected by most homeowners. 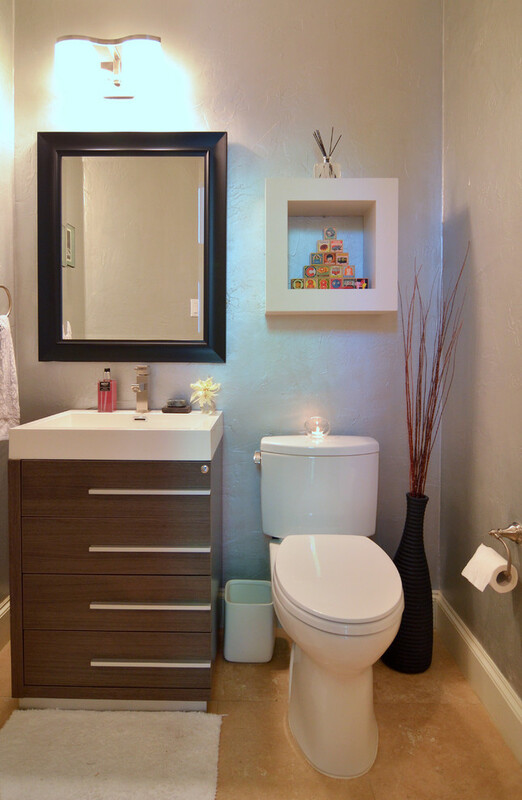 A single corner bathroom vanity is smart choice for a small bathroom. It can be space-efficient by its size. 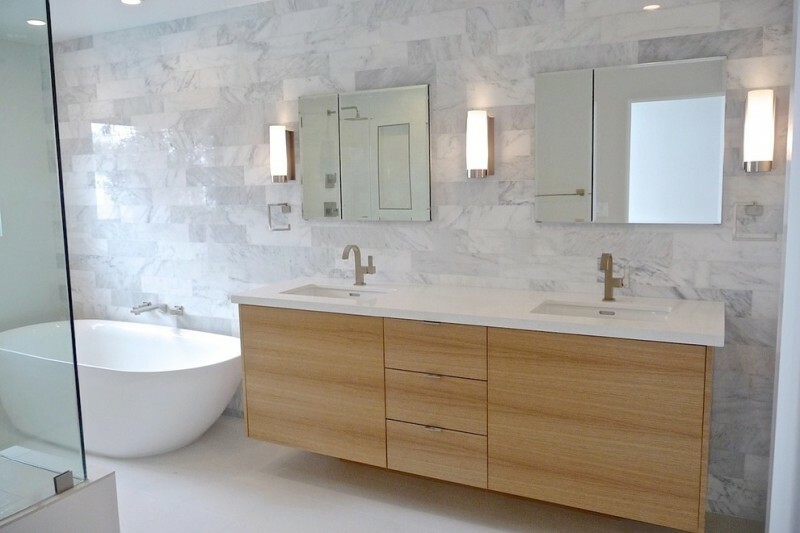 Re-model your master bathroom with this floating corner vanity designed in contemporary style.